Parts for compete recap of all the electrolytic capacitors. Complete recap of all PCB (if such present). The best one is to rebuild those original cans. This technique will keep the original look of the unit. Each one of these units were pulled from working McIntosh MC2100. These are also compatible for the MC2105. Guaranteed to be working properly. If you look at the photos, the surge ratings are a little bit different, which do not affect the performance of the overall amplifier they are used with. The increase in bass performance is astonishing. These cans can be used anywhere the original cans of similar size are used. We will give you instructions on how to use these and all of our capacitors and products. Very flexible capacitor can. We also have the other Capacitor cans for the listed units available. 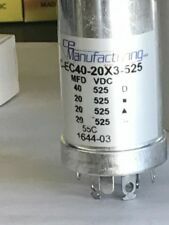 40/20/20/20uF 525VDC Electrolytic. Reproduced To Exact Mallory Specs Using Original Mallory Machinery. The amplifier is not performing to its full capability as well. We also have the other Capacitor cans for the listed units available. This is a high temperature axial electrolytic. These can be left alone. The amplifier is not performing to its full capability as well. We also have the other Capacitor cans for the listed units available. This is a high temperature axial electrolytic. 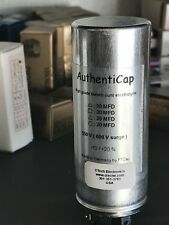 We also have the other Capacitor cans for the listed units available. (1) 22uf / 250 V High Temperature Electrolytic for replacing the Bias Filter Cpacitor. You can replace the the 80/35/15 uf can in the MC30 with this can (connect the 80/20 uf sections together to get increased capacitance of 100 uf, use the 40 uf sections to replace the 35 uf sctions, the 20 uf sections to relace the 15 uf sections ). We also have the other Capacitor cans for the listed units available. This results in better midrange tone and feeling of cleaner upper midrange and extended highs. The amplifier is not performing to its full capability as well. The best one is to rebuild those original cans. This technique will keep the original look of the unit. Parts for compete recap of all the electrolytic capacitors. (if your the version of your unit needs it). "SEE PICS". THESE 14V-20mA WARM WHITE LED BI-PINS ARE NON-POLARIZED ! Although targeted for the MC275. this kit can also be used on other amplifiers as well. You can replace the the (4) 100/30 uf cans in the MC275 with these (connect the 80/40/20 uf sections together to get increased capacitance of 140 uf, use the 30 uf as is). We also have the other Capacitor cans for the listed units available. Very flexible capacitor can. 50 µF, 50 µf, 50 µF and 50 µF section, all rated at 350 VDC. (1) 1A 1000V PIV Silicon Diode for replacing the Selinium rectifier 4 x 1N4007 rectifiers for main Bridge .01 uf Bridge suppressor capacitors. We also have the other Capacitor cans for the listed units available. We also have the other Capacitor cans for the listed units available. (1) 22uf / 450V High Temperature Electrolytic for replacing the Bias Filter Capacitor. (1) 3A 1000V PIV Silicon Diode for replacing the Selinium rectifier. (THESE COLORS ARE AVAILABLE TO CHOOSE FROM. COOL BLUE-COOL WHITE-WARM WHITE & GREEN BAYONET 6.3V. THESE DO NOT PRODUCE ANY HEAT ! SEE PICS AVAILABLE ! "SEE PICS". LED lights also last longer since they draw less energy from the system. ). Lamp Type: LED. Lamp size: 4mm. Thebest one is to rebuild those original cans. This technique will keep the original look of the unit. Parts for compete recap of all the electrolytic capacitors. (if your the version of your unit needs it). The amplifier is not performing to its full capability as well. We also have the other Capacitor cans for the listed units available. This is a high temperature axial electrolytic. We also include a 2 1N4007 diodes to replace the 2 selenium rectifiers and (1) 1W 11V Zener diodes to compensate for replacing them with silicon diodes. Although targeted for the MC60. this kit can also be used on other amplifiers as well. 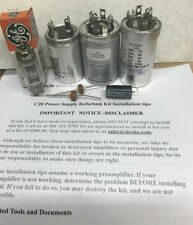 Our refurbish Kit includes the following You can replace the the (2) 80/35/15 uf cans in the MC60 with these (connect the 80/20 uf sections together to get increased capacitance of 100 uf, use the 40 uf sections to replace the 35 uf sctions, the 20 uf sections to relace the 15 uf sections ). Although targeted for the MC40. this kit can also be used on other amplifiers as well. The increase in performance of the MC40 with this kit installed is very significant, especially in bass palpability punch and imaging. 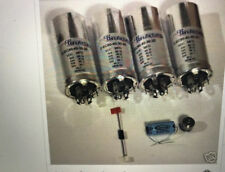 These replace the 150uf capacitors for another terrific increase in bass performance. (3) 1N4007 Silicon Diodes. We also have the other Capacitor cans for the listed units available. Although targeted for the MC 225 this kit can also be used on other amplifiers as well. YOU CAN MIX OR MATCH COLORS! LED lights also last longer since they draw less energy from the system. YOUR CHOICE! 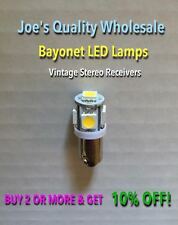 I have seen many bad quality restorations/fix jobs done to these units that made them sound cheap and very low quality. 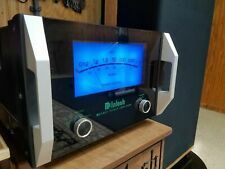 Knowing how amazing and warm these units can sound, I have decided to develop this kit to help you do a great job on your McIntosh. We also have the other Capacitor cans for the listed units available. (1) 22uf / 450V High Temperature Electrolytic for replacing the Bias Filter Capacitor. (1) 1A 1000V PIV Silicon Diode for replacing the Selinium rectifier. 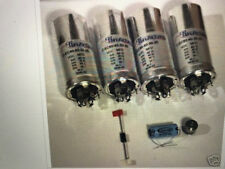 These replace the 150uf capacitors for another terrific increase in bass performance. We also have the other Capacitor cans for the listed units available. (1) 1A 1000V PIV Silicon Diode for replacing the Selinium rectifier. Although targeted for the MC60. this kit can also be used on other amplifiers as well. You can replace the the (2) 80/35/15 uf cans in the MC60 with these (connect the 80/20 uf sections together to get increased capacitance of 100 uf, use the 40 uf sections to replace the 35 uf sctions, the 20 uf sections to relace the 15 uf sections ). LED lights also last longer since they draw less energy from the system. "SEE PICS". EXTRA 10% OFF WHEN YOU BUY 2 OR MORE LOTS ! BASE: Bayonets BA9S. MIX OR MATCH COLORS! LED lights also last longer since they draw less energy from the system. "SEE PICS". BASE: Bayonets BA9S. MIX OR MATCH COLORS! LED lights also last longer since they draw less energy from the system. LED lights also last longer since they draw less energy from the system. "SEE PICS". BASE: Bayonets BA9S. LED lights also last longer since they draw less energy from the system. BASE: Bayonets BA9S. LED lights also last longer since they draw less energy from the system. "SEE PICS". MIX OR MATCH COLORS! LED lights also last longer since they draw less energy from the system.